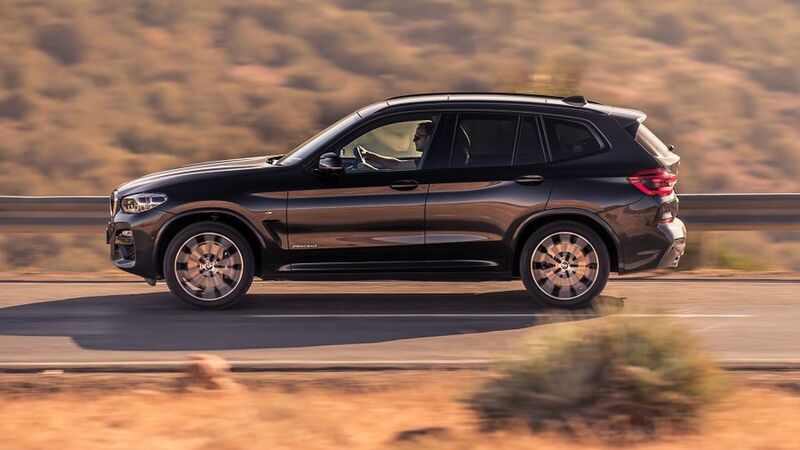 There was a time when the BMW X3 was your only choice of premium-badged mid-size SUV, but those days are long gone. You must now choose between the Alfa Romeo Stelvio, Audi Q5, Jaguar F-Pace, Mercedes GLC, Porsche Macan and Volvo XC60, and more and more rivals are emerging all the time. Question is, is the Beemer still the pick? 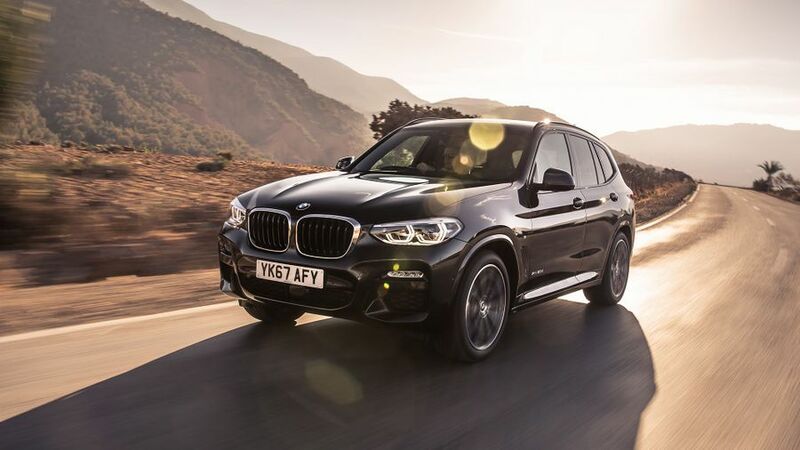 The BMW X3 isn’t short of rivals these days, but it’s still worthy of its place near the top of the prestige SUV class. It provides a luxurious, family-friendly cabin that’s stacked with technology, and the driving experience is comfortable, quiet and polished. It’s competitive with its closest rivals on price and running costs, making it a solid and sound financial proposition. Perhaps most importantly, though, it has the looks and the image that buyers of cars like this demand. It could come with more standard safety kit, but other than that, it’s very difficult to fault. Interested in buying a BMW X3? The X3 shares much with the bigger 5 Series saloon, and you can really tell that when you climb inside; this car is absolutely dripping with quality. All the surfaces that you see and/or touch are absolutely full of sensory appeal thanks to their dense feel and lustrous finishes, and the way everything fits together also helps deliver a feeling of effortless classiness. The sharp, slick graphics used in the instrument panel and infotainment system also help on that score. 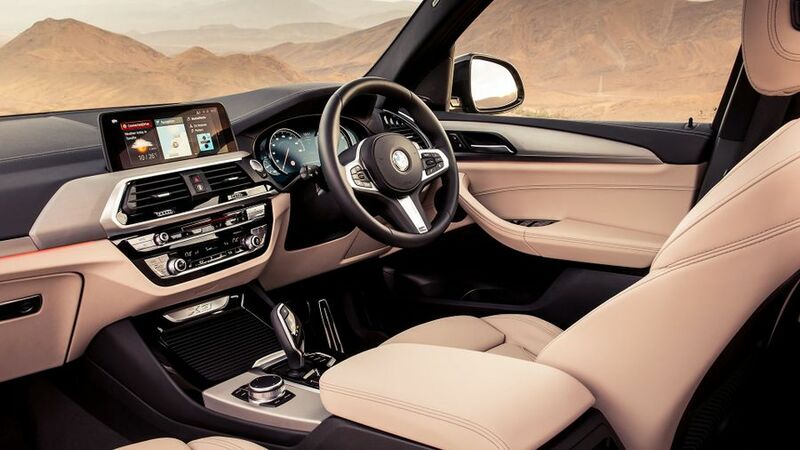 All the various controls and operating systems will be familiar fare to any existing BMW customer, and that means they’re among the best in the business for ease-of-use. You’ll also like that the supportive seats have a wide range of adjustment that makes finding a comfortable driving position an absolute doddle. Your rearward visibility is pretty good, too, with very few blind spots. SUVs are the car of choice for fashion-conscious families these days, so a strong performance in this area is an absolute must. Happily, the X3 does a cracking job. The rear seats have plenty of headroom and legroom, allowing even tall adults to get comfy, and the wide middle seat and ample shoulder room means that cramming in a third person into the back isn’t out of the question. That said, whoever draws the middle seat will have to straddle a bulky transmission tunnel, limiting the foot space available. The boot is identical in size to its rivals from Audi and Merc, meaning it’s big enough to swallow pretty much anything a demanding family can throw at it, and it’s also a usefully square shape. The boot floor also lifts up to reveal storage underneath, and it’s also supported by a handy pneumatic strut. The rear seats have reclining backrests that are split in a 40/20/40 arrangement, and when you fold them down, they sit more or less flat and perfectly flush with the boot floor, which makes loading heavy items much easier. You also get handy extra catches in the boot that allow you to drop the seats from the loadbay. 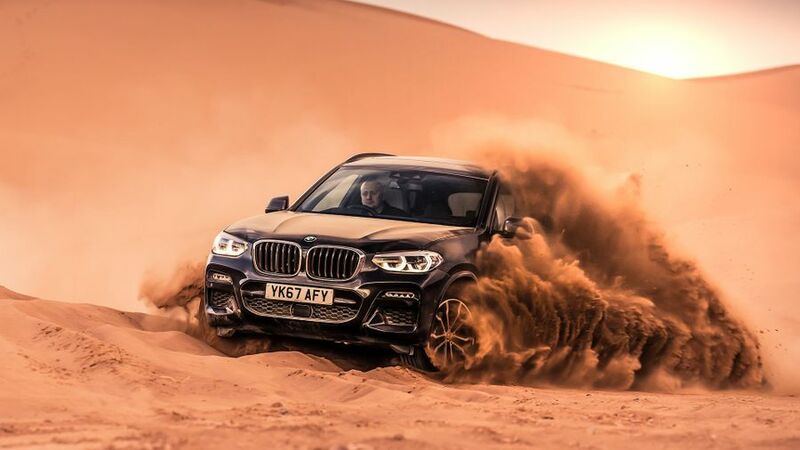 You can have your X3 with one of three suspension setups; the normal one that most versions come with as standard, a stiffer sports suspension that comes as standard on M Sport models and is an optional extra on other models, and an adaptive setup that’s optional across the board. So far, we’ve only had the opportunity to drive the car with the adaptive arrangement, which adjusts its behaviour according to which driving mode you select. Regardless of whether you happen to be in ‘Comfort’ or ‘Sport’, there’s is a slightly firm edge to the ride, meaning you can feel the nuances in the surface beneath you. However, it still manages to shield you very well from the effect of bigger bumps and potholes, to it’s still an impressively comfortable way to travel. Selecting the sportier mode does make more of a difference with the handling because body roll is more tightly controlled, allowing the car to change direction with more sharpness. The car’s permanent four-wheel drive also helps maximise grip and traction in the corners, and because a bigger slice of the drive is sent to the rear wheels, the car feels even more alert. The responsive steering also helps on that score, and it’s also well weighted and offers a decent amount of feel. The vast majority of X3 buyers will opt for diesel power, and there are two choices available. The most popular will be the 20d, which comes with the same 2.0-litre diesel engine found in most BMW models. The large slice of low-rev urge it delivers means that very little effort is needed to get the car up and running, and it builds speed pretty easily on the move, too. It also stays quiet and smooth most of the time, with the calm only being disturbed if you really floor it. Thing is, flooring it doesn’t ultimately make the 20d go a whole lot quicker anyway, so you’re best off just sitting back and adopting a lazy driving style. The 3.0-litre engine in the 30d is worth the odd flooring, however, because it’s capable of throwing you down the road with a really impressive amount of force. More impressive, though, is the effortless way it goes about its business, allowing you to breeze up to cruising speeds, and maintain them, without breaking a metaphorical sweat. Perhaps the best thing about the six-cylinder 30d, however, is how much smoother and quieter it makes life than the four-cylinder 20d does. All versions come with an eight-speed automatic gearbox as standard, and left to its own devices, it’ll slush through the gears smoothly and cleanly with very little interruption to the drive. You can also take control and change gears yourself using the paddles, and when you do, the changes remain swift and smooth. If you fancy a petrol engine in your X3, you can have a 2.0-litre in the 20i or a fire-breathing 3.0-litre in the range-topping 40i. We haven’t yet had the chance to try either of these, though. As you’d expect, there’s very little to separate the main contenders in this fiercely competitive sector. Take the most popular X3 – the 20d – as your example, and you’ll find that fuel consumption and CO2 emissions are virtually identical to those of the equivalent versions of the Audi Q5 and Mercedes GLC, and only a shade better than those of the Jaguar F-Pace. There’s very little to separate the rivals on price, either, and because they’re all highly desirable cars with a prestige image, they’ll all hold onto their value with similar stubbornness. So, unless you can wangle yourself an incredible deal on one of them, the car you choose will simply be the car you want most. Look at the Warranty Direct Reliability Index and you might be a little put off, as previous versions of the X3 haven’t scored too well. However, the latest car has more in common with the latest 5 Series than it does the previous X3, so there’s every hope the latest model could prove hardier. BMW puts in a fairly mediocre showing in the manufacturer standing of the same study, but importantly, it sits higher in the table than its big rivals in Audi and Mercedes. And, you should get more peace of mind from the fact that all new BMWs come with a three-year/unlimited-mileage warranty. 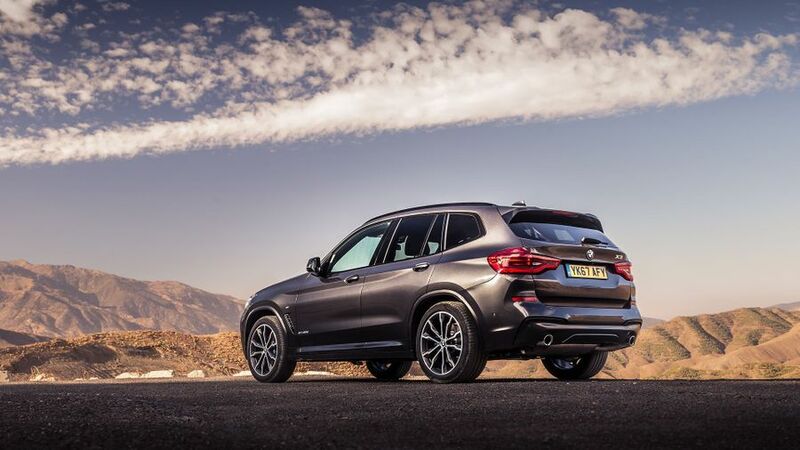 The latest X3 hasn’t yet been crash-tested by the experts at Euro NCAP, but it’s mechanically very similar to the 5 Series saloon and that car has achieved the full five-star rating, along with impressive score in each and every area. The standard roster of safety kit includes the usual array or airbags (six as standard), electronic stability systems, and the automatic emergency braking function that you get on pretty much every rival these days. You can also enhance your car’s level of safety equipment by adding various option packs. The more basic one includes various lane-changing tools and systems for preventing rear impacts, while the enhanced package provides all this plus a system that pretty much drives the car when you’re trundling along in traffic. None of this comes cheap, though. SE trim is the first rung on the ladder, and this version comes with most of the luxury kit you need. That includes leather upholstery, alloy wheels, three-zone climate control air-conditioning, automatic lights and wipers, a powered tailgate, a parking assistant (which steers into the space for you) complete with sensors and camera, plus an all-singing infotainment system that includes DAB radio, Bluetooth phone connections, sat-nav and all manner of connected services. The upgrades you get with xLine trim are largely aesthetic but you do also get sports seats and a larger fuel tank. M Sport trim is the most popular thanks to its even more flamboyant styling upgrades, but you also get an upgraded infotainment system with much bigger screen, digital dials and a sports suspension. Naturally, a vast array of optional extra are also available – many of which are arranged into packs – so if you’re prepared to fork out for it, your car can have everything from a TV to a wifi hotspot. Because you want your family car to have the style and prestige that only a premium-badged SUV can deliver, but comfort, driver appeal and interior quality are also very high on your list of priorities. 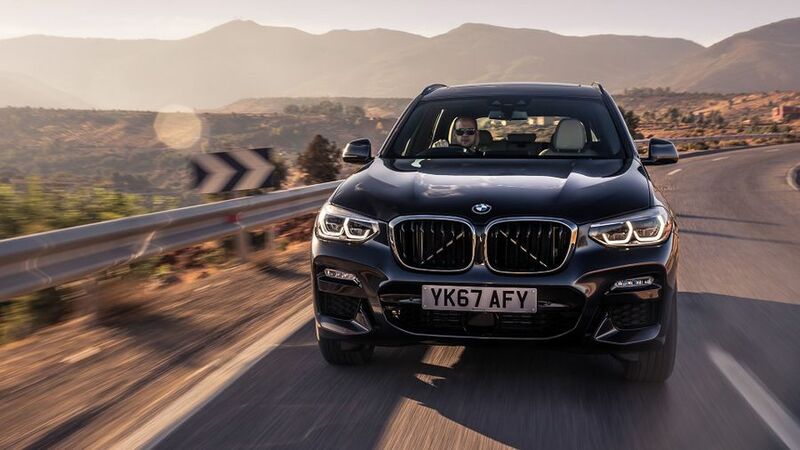 The X3 is a cracking all-rounder that’s strong in pretty much every area, and we wouldn’t recommend buying a car of this type without at least trying it.